Terriers rebounded from Friday night's loss with a 3-1 win at Merrimack, completing a sweep of the season's three games against the Warriors. 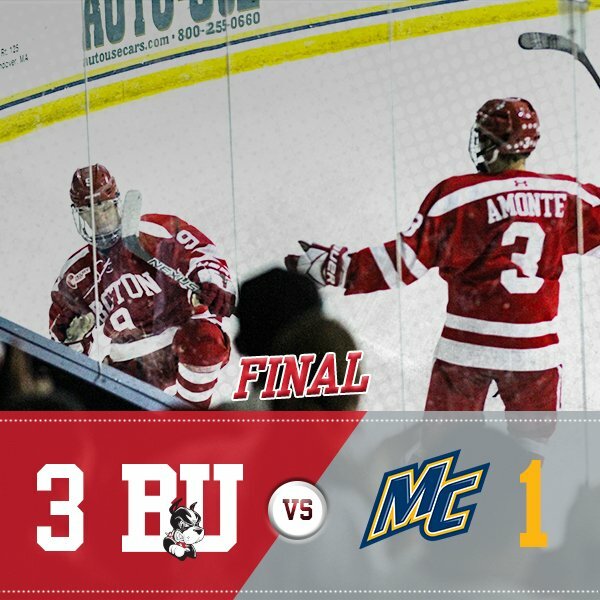 BU received goals from Dante Fabbro, Gabe Chabot and Logan Cockerill, while Jake Oettinger turned aside 28 shots including 12 in the third period. Neither team could find the net until late in the second when BU scored on the power play. Shane Bowers took a pass from Brady Tkachuk and found Dante Fabbro at the center point for a blast past Merrimack's Craig Pantano. Minutes late, David Farrance centered a pass to the goal mouth that Chabot redirected home for his first goal of the year and a 2-0 lead. Chad Krys also assisted. Once again, BU saw a two-goal lead cut to one early in the third period when Merrimack defenseman Simon Lööf fired a shot from the point off a clean win of an offensive-zone draw. His one-timer glanced off a Terrier defender and went past Oettinger. Midway through the period, just after a BU power play ended, Cockerill restored the two-goal margin. On the rush, Drew Melanson found Brandon Hickey in the high slot and the captain fed Cockerill whose wrist shot from the left face-off dot beat Pantano, high to the glove side. With the win BU has sole possession of fourth place in Hockey East, two points ahead of Maine and UConn. The Terriers conclude the regular season next weekend with a pair of home games with Vermont. 2019 recruits Joel Farabee, Jake Wise and Jack DeBoer all assisted on a goal in Team USA’s 4-0 win against Finland to clinch the Five Nations Tournament championship in Plymouth, Michigan. Farrabee’s assist gave him 49 points (22G, 27A), second best on the U18s. Senior captain Rebecca Leslie scored both Terrier goals in a 2-1 win against New Hampshire in Durham. 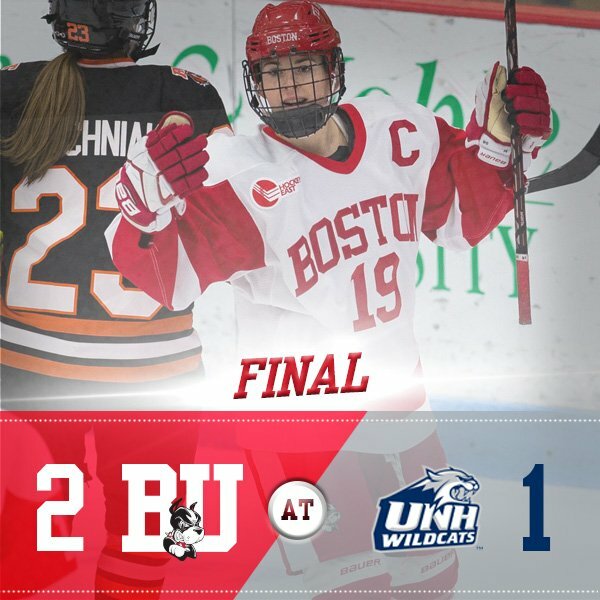 Her first period goal was assisted by Abby Cook and Mary Grace Kelley, while her third period tally, giving BU a 2-0 lead, was assisted by Cook and senior Victoria Bach.